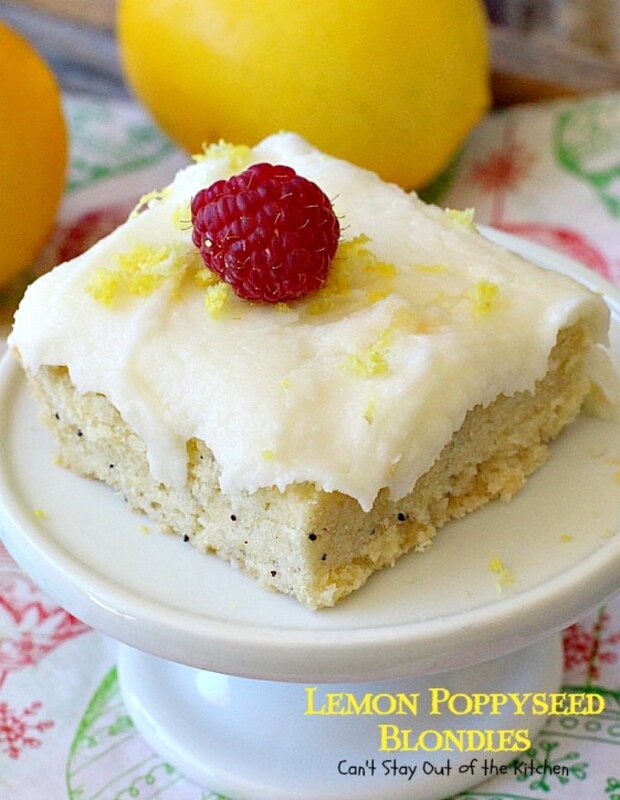 Lemon Poppyseed Blondies are awesome! 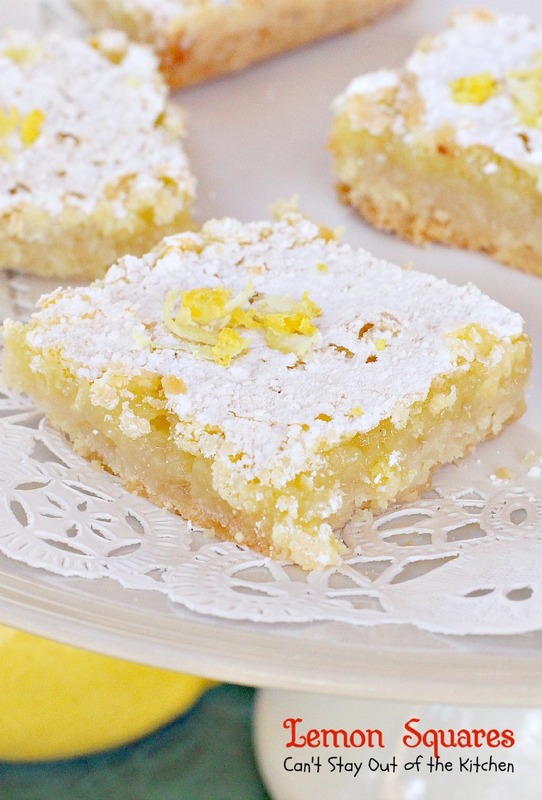 These heavenly bar-type cookies have a tasty lemon poppyseed shortbread crust. 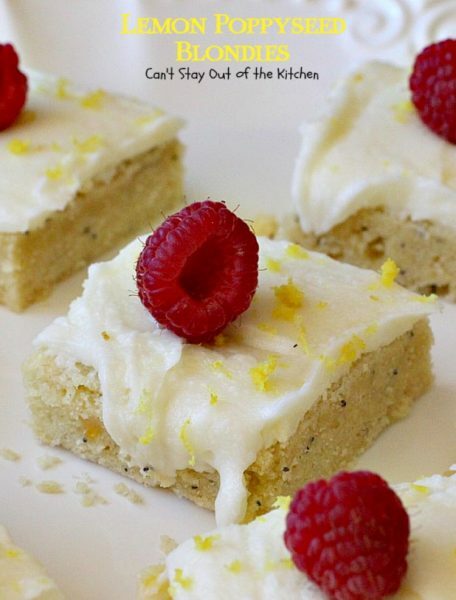 But the kicker is the thick lemony powdered sugar frosting. Oh yeah! 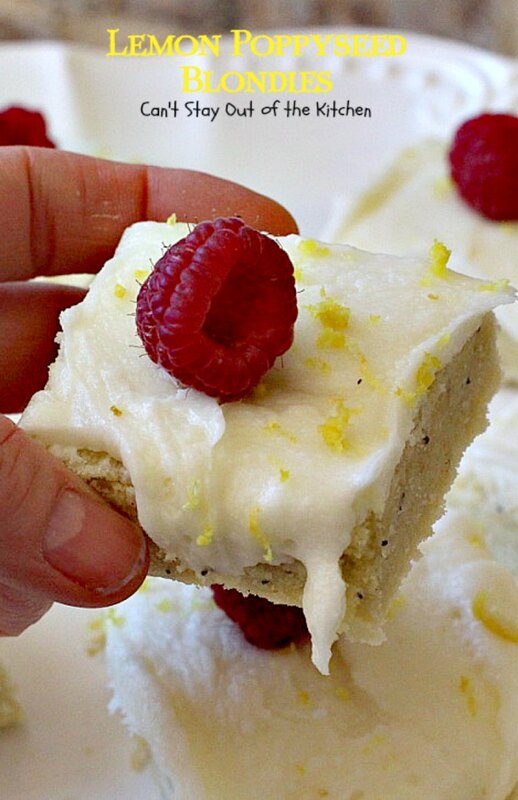 Then the frosting is sprinkled with lemon zest and I topped the bars with fresh raspberries. Yes, Siree! These cookies are the real deal. I was busy baking cookies and blondies for our Christmas Cookie Extravaganza this year when I ended up with a whole lot of leftover icing from making Cranberry Lemon Sandwiches. I wondered what I was going to do with all that extra icing. I hated to throw it away so I refrigerated it. 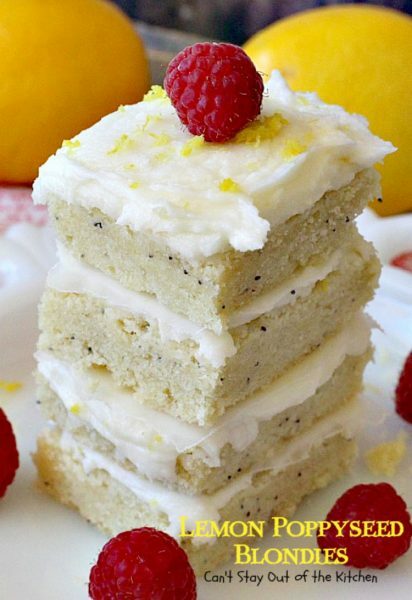 That night while I was trying to get to sleep, I came up with the idea to put the icing on top of a luscious lemon poppyseed shortbread base like these, these, these, and these. 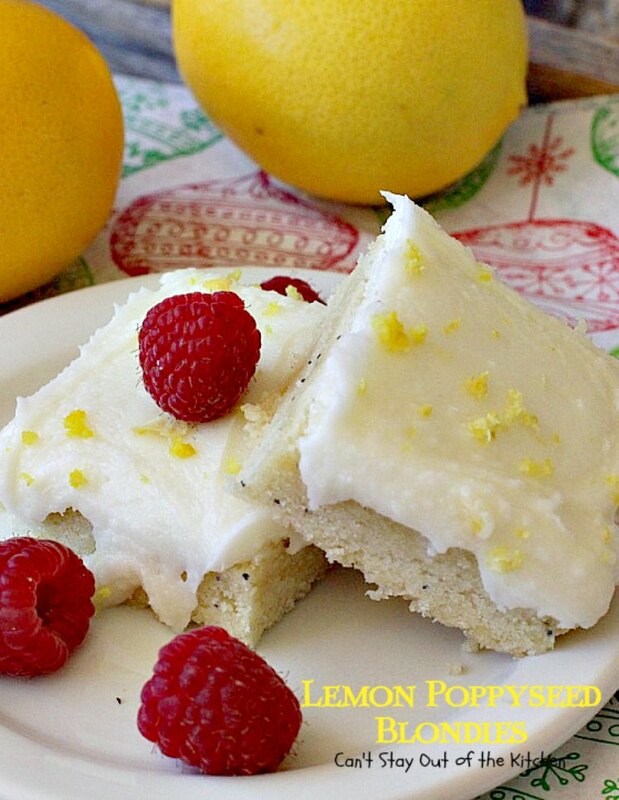 If you enjoy lemon desserts this one is really amazing. 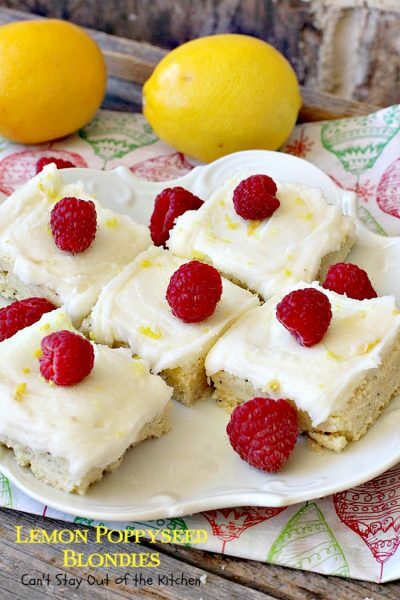 It has strong lemon flavor in the cookie and the icing, and then on top of the icing. Lemon zest sprinkled liberally on top made these cookies fantastic. 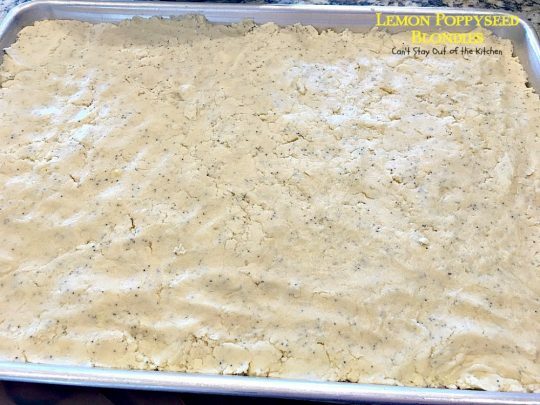 If you’re looking for a super scrumptious recipe for your next potluck or holiday fare, I can’t recommend Lemon Poppyseed Blondies enough. They’re divine! And, of course, if you love icing on your cookies, then these are to die for! Lemon Poppyseed Blondies are awesome. Especially if you like frosting oozing down the sides of the bar! The Lemon Frosting is so delicious. 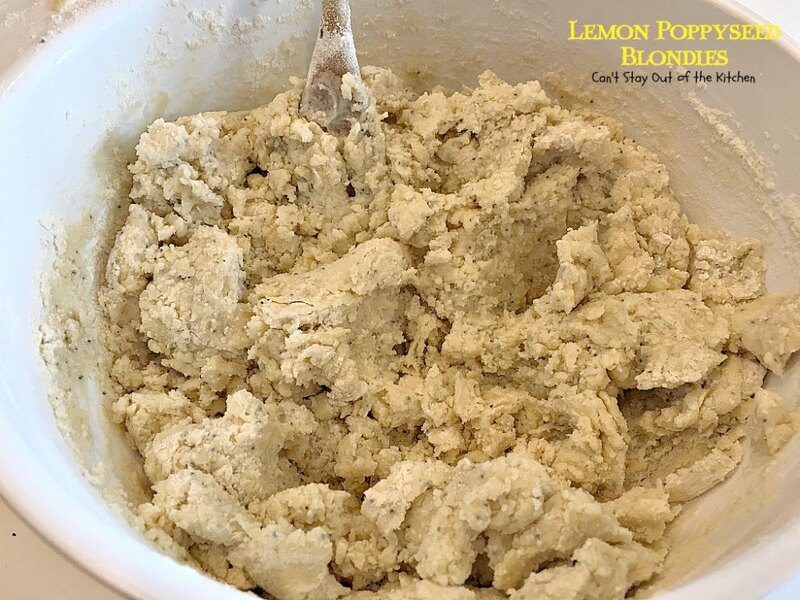 If you take these blondies to a holiday party or a Super Bowl game, they’ll be gone in a jiffy! I used these ingredients for the blondies. 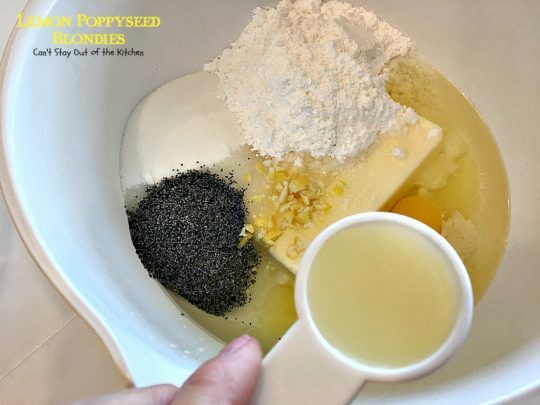 While I only used one tablespoon poppyseeds, you can use more if you desire. 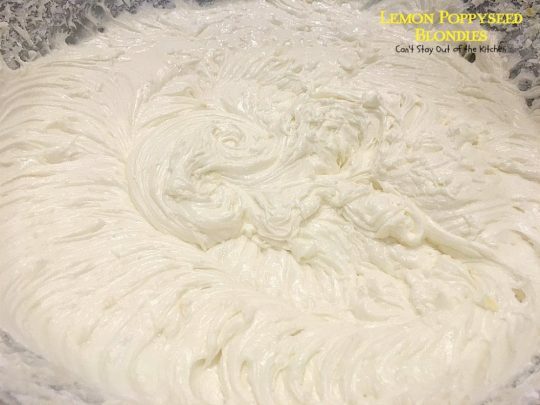 Place softened butter in a large mixing bowl. 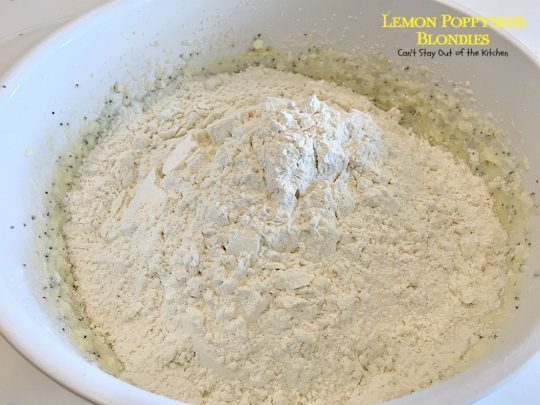 Add oil, eggs, sugar, powdered sugar, lemon zest, lemon juice, poppyseeds, cream of tartar, baking soda and sea salt. Add UNBLEACHED all-purpose flour. Bleached flour toughens baked goods. 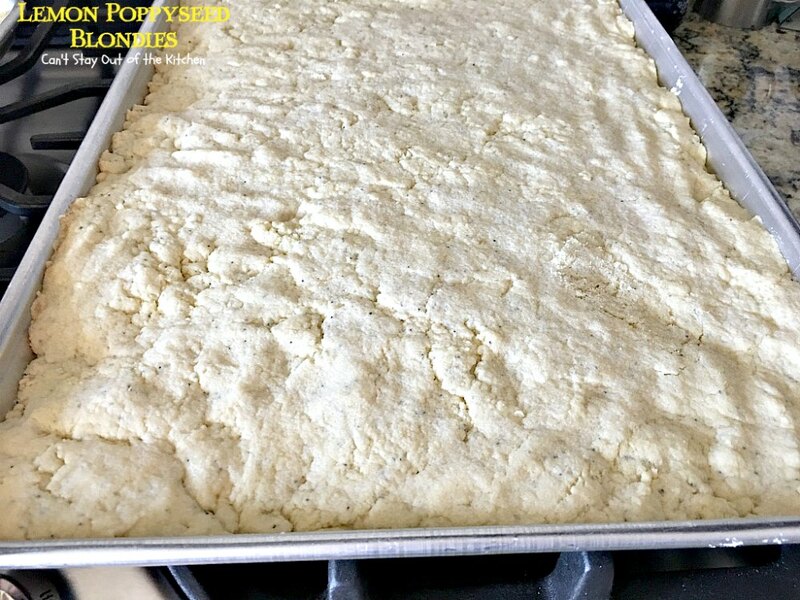 Press mixture down into a greased 12×17″ cookie sheet. Bake at 350 for 30-35 minutes or until a toothpick inserted in center comes out clean. Cool completely before spreading with frosting. I used these ingredients to make the icing. 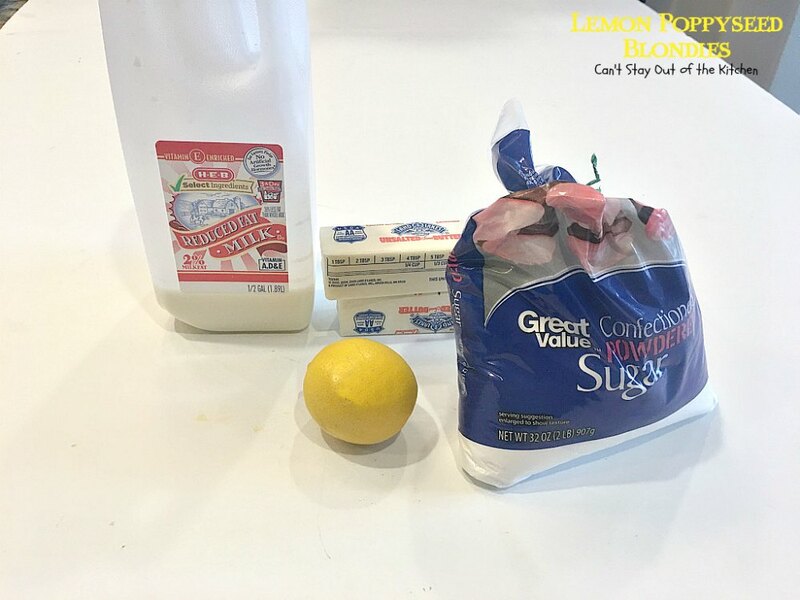 Mix with an electric mixer to combine. 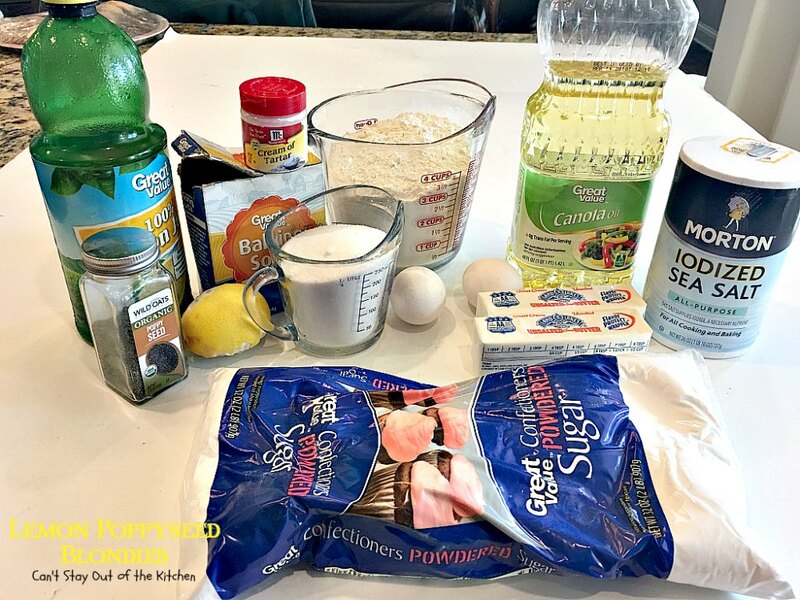 (This is a triple batch so it is much more than you will need for this recipe). Spread icing over cooled shortbread bars. Sprinkle generously with lemon zest. Cut into 48 bars. (I highly recommending refrigerating the bars a couple of hours before cutting). 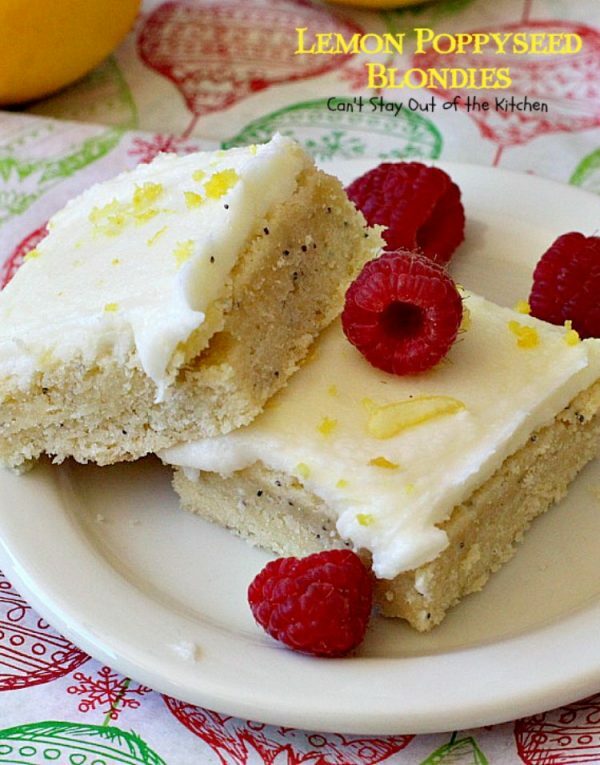 Lemon Poppyseed Blondies are terrific for holiday baking. Everyone loves them. These make great treats to take to office parties. 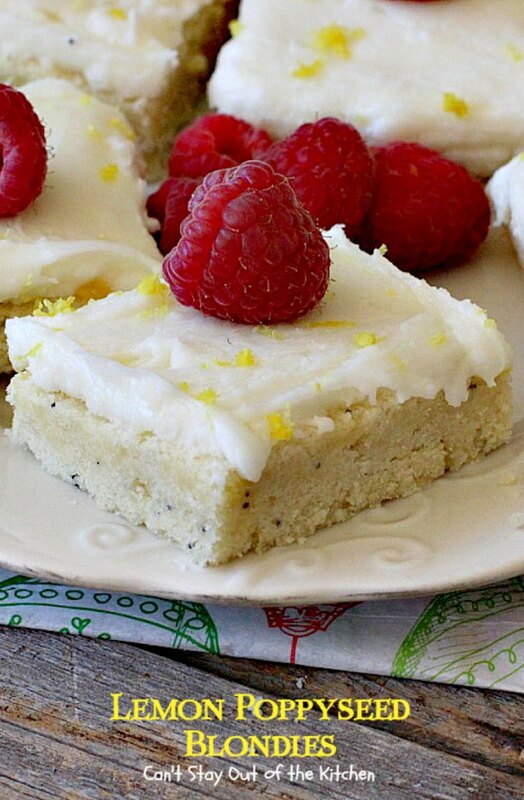 Lemon Poppyseed Blondies are heavenly. You won’t be able to stop eating them! These luscious blondies are filled with lemon zest and juice, poppyseeds and topped with a marvelous lemon frosting & more lemon zest. Great for any party or potluck. Cream together butter, canola oil, sugars, lemon juice, lemon rind, eggs, poppy seeds, baking soda, cream of tartar and salt. Add flour and stir with a wooden spoon until thoroughly mixed. Press dough into an 12x17” jelly-roll style cookie sheet. Bake at 350° for 30-35 minutes or until lightly golden brown on top. 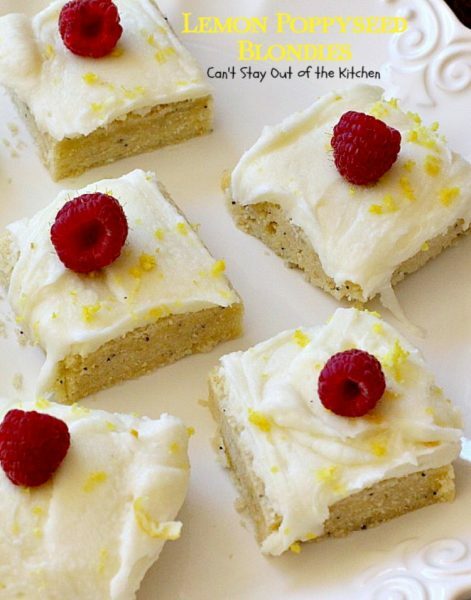 Sprinkle additional lemon zest on top of frosting. Allow icing on blondies to set before cutting into bars. 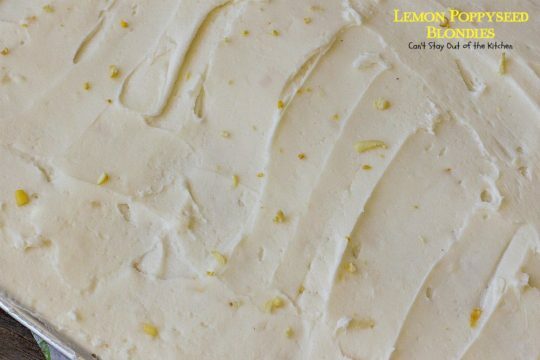 Mix ingredients with an electric mixer until smooth and creamy. Spread over top of cooled, Lemon Poppyseed Blondies. Sprinkle generously with freshly grated lemon peel. 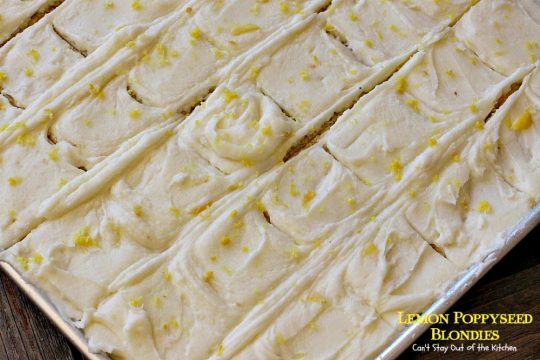 Allow icing to dry and harden slightly before cutting into bars. 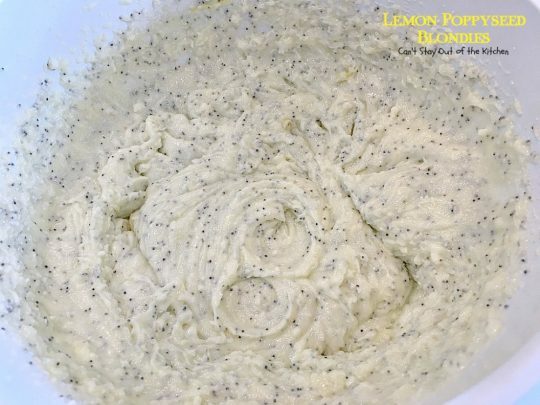 NOTE: If you want an explosion of flavor, use 2 full tablespoons of poppy seeds in cookie dough. NOTE: I used an additional 1-2 teaspoons of freshly grated lemon peel on top of the icing. NOTE: You can also refrigerate these bars 2 hours before cutting so the frosting sets up better. Are you starting to drool? Lemon Poppyseed Blondies are sure to be a crowd pleaser wherever you take them.